That would be a bit too easy. Most of the time the pickguard that rattles is so slightly loose it hardly shows at all. Old Martin pickguards (Gibson and Guild pickguards as well) were glued to the face of the guitar before finish was applied. The solvent or solvent dried hard and brittle, so the loose pickguard can rattle a bit when vibrated. More modern pickguards like this Taylor's are glued to the finished surface with a resilient adhesive that dampens vibrations so they're less likely to cause buzzing if they come loose. 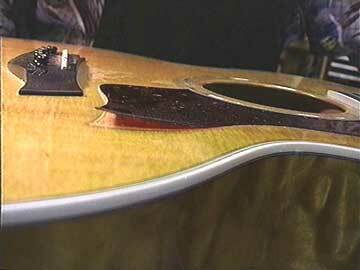 In any case, a loose pickguard is a relatively rare cause of buzzing. Fixing this buzz is just a matter of regluing the pickguard. Here's a special technique for regluing those old Martin pickguards. The newer, "stick-on" pickguards must be replaced if they curl up and get loose.